The RSeries is the ideal kite for performance riding in all styles and conditions. Its versatile cross over character adopts to the riders preferences, enabling him or her to boost big airs, throw spray of the lip of a wave or even land handlepass tricks. We placed the turning axis of this four-line kite at its shoulder to create the perfect balance between powerful tip turning and pivotal center turning. This results in smooth turning velocity with a good amount of grunt. Perfect to initiate big air jumps and old school tricks. A medium to high aspect ratio ensures you have a good lift/drag ratio. The RS provides a grunty pull and when triggered, it will take you up to massive heights. The design ensures that you sail down gently as the kite easily catches you. Even in choppy waters or gusty wind, going upwind is easy. The combination of bridle set up, sweep and aspect ratio ensures a wide wind range, stability and a position in the wind window that pulls you upwind. 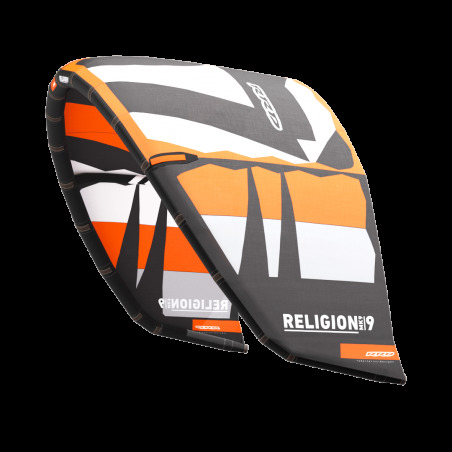 In short, the RS is a very agile but stable performance freeride kite that guarantees fun! Make sure to look up our E/8 Trusted Quality section for more information on the many features and quality aspects of the RS.